Mirabelle & Almond Tart – Dig Delve – An online magazine about gardens, landscape, growing & making. One of the best things about growing your own fruit and vegetables is the opportunity it provides to eat things that are seldom, if ever, available at the greengrocers. 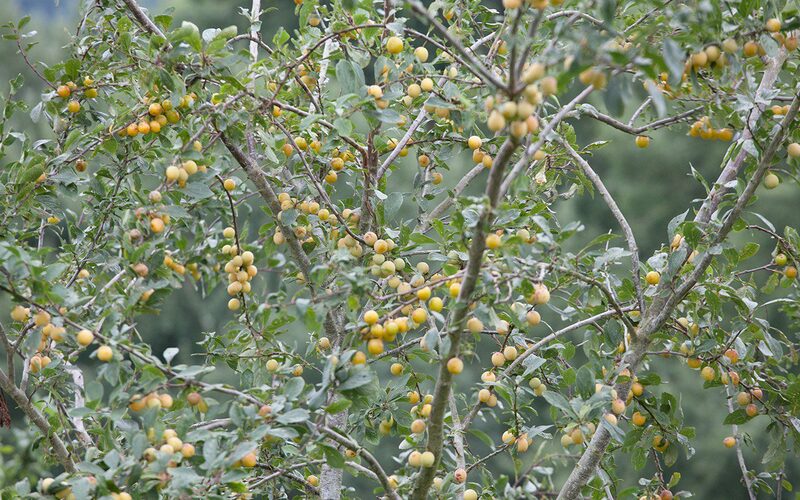 Before we planted our orchard I had never eaten a Mirabelle plum. Although I had pored over Jane Grigson’s description of their superior flavour, and heard from my Francophile friend Sophie of the delicious tarts and pies she had eaten in Lorraine, I had always had to imagine what they tasted like. The Mirabelle is the smallest plum, barely bigger than a large marble, but what it lacks in size it definitely makes up for in flavour. Perfumed, and with the same floral hint of muscat that you get from the best gooseberries, they are the plum par excellence. We are now getting a very decent harvest and, when something so rare and prized suddenly becomes easily available, it feels important to celebrate the moment with a dish that makes the most of this fleeting moment. 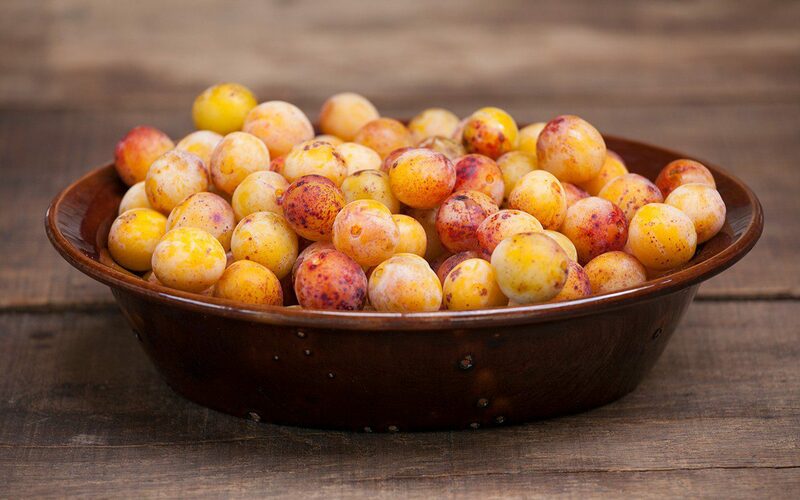 You need a fair number of Mirabelles to make a tart of this size, but they are quick to pick. De-stoning a large bowl of them also appears an intimidating prospect but, being a ‘freestone’ variety of plum, where the stone separates easily from the flesh (unlike ‘clingstone’ plums where the flesh adheres to the stone) they are also easy to prepare. Plums and almonds are all from the Prunus family, and so make perfect companions in in desserts. The flavour of the almond frangipane is improved by the addition of a number of kernels taken from the stones, which enhances the bitter almond flavour, but a few drops of almond essence or, if you happen to have it, a teaspoon or two of plum eau de vie do a similar job. The Mirabelle season is painfully short. The tart here was made last weekend, when the plums were at their peak of perfection. This week the tree is bare. So, if you have missed the moment or can’t get hold of them, you can use any other stone fruit in their stead. Greengages are the next best choice of plum, but other yellow cooking plums would work, as would apricots. 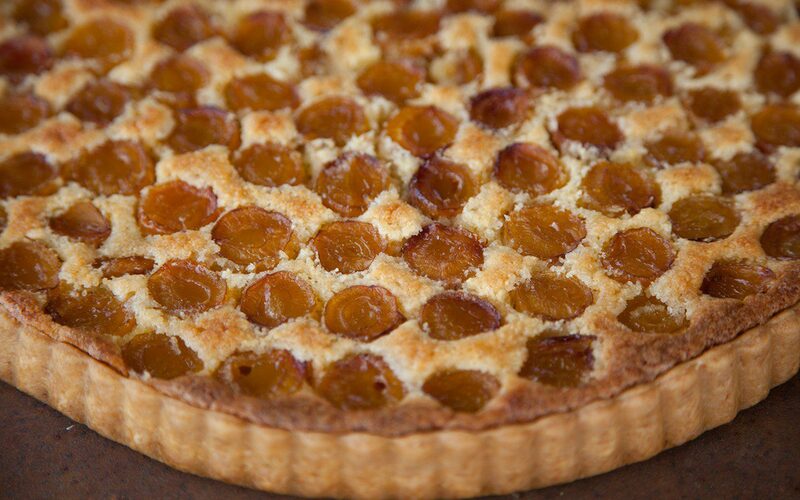 Later in the season the frangipane can be made with ground walnuts, which makes a more autumnal partner for sharp red or purple plums. This year I plan to try a walnut version with some of our damson glut but, being mouth-puckeringly sharp, they will need to be poached in a sugar syrup first. You will need a 30cm shallow, fluted tart tin. Put the flour and butter into a food processor and process quickly until the mixture resembles very fine breadcrumbs. You can use your hands to do this, but a processor is better as it is important that the pastry stays as cold as possible. Add the icing sugar and pulse again quickly to combine. With the motor running add the egg yolk, and then enough chilled water, a tablespoon at a time, until the dough just starts to come together. Immediately turn off the processor and bring the dough together quickly and lightly with your hands until smooth. Do not knead it. Immediately roll the dough out, preferably on a cold, floured slate or marble surface, with short, light movements until just large enough to line the tin. To get the pastry, which is very short, into the tin, ease your floured rolling pin underneath it and then very gently lift it over the tart tin until it is centred, before removing the rolling pin by sliding it out. Again handle the pastry very gently as you press it into the corner and fluted sides of the tin. Trim the pastry in line with the top of the tin, prick the base with a fork and then chill in the fridge for 20 minutes. Remove the pastry case from the fridge, line it with baking parchment and then fill with baking beans. Bake blind for 20 minutes. Remove the baking beans and parchment and return to the oven for a further 10-15 minutes until the pastry looks dry but has not coloured. Remove from the oven and leave to cool. Put the ground almonds and sugar in a mixing bowl, reserving a tablespoon of sugar. In a mortar and pestle crush the Mirabelle kernels with the tablespoon of sugar then add them to the ground almonds, before mixing in the butter, egg and cream. 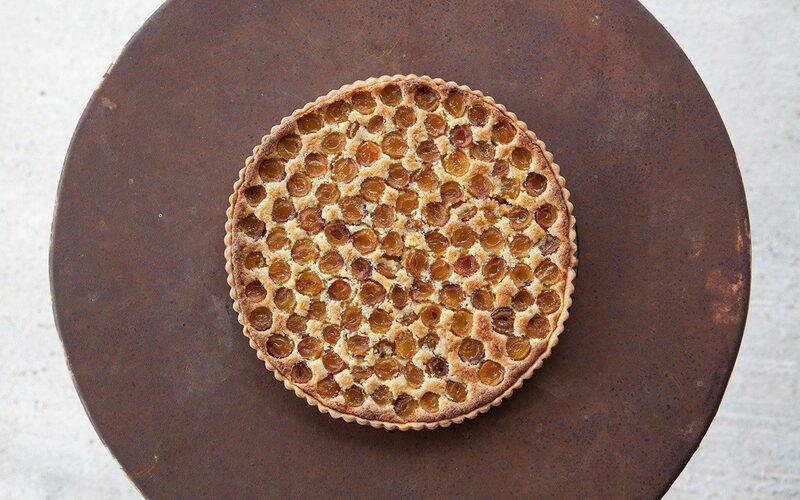 Spread the almond cream evenly over the base of the cooled tart case. Then, starting from the outside, arrange the Mirabelles on the almond cream with their cut sides facing up and so that they are just touching. Push each one gently into the cream as you do so. Bake for 30-40 minutes, until the pastry is well coloured and the mirabelles are bubbling. Remove from the oven. Allow to cool for 15 to 20 minutes before carefully removing from the tart case. Serve warm with cold pouring cream.